About the author: Matt Marcotte works with T&J Supplies as a business advocate and sales leader. Matt managed a high-volume contract production print shop with national retail clients like Target and Threadless. Matt's experiences offer valuable insight into developing management skills under tremendous pressure. He writes, teaches, builds relationships, and shares knowledge with hundreds of print shops throughout the midwest. Matt is an advocate for systems-based solutions that resolve production problems before they start. You can learn more about him and visit his website at marcotte.ink. I’ve worked with print shops across the midwest since 2014, and in high-volume contract shops for a decade before that. The primary struggles at every shop are similar, regardless of the size: how do we ensure we’re printing profitably so we can cover our bills and pay our staff? Though sales and marketing are a big part of generating profit, the simplest way to improve your profitability is to look inside your organization. Where is your staff spending their valuable time? How are you spending your money internally? Which processes are costing you productivity? "Don't look for minutes. Start looking for seconds." In my own struggles with managing screen printers, I’ve always struggled to find ways to squeeze more productivity out of my staff and find more time in my production schedule for printing. I tried to deconstruct the entire day of production from the top down with diagrams, charts, even complicated performance tracking metrics. This approach wasn’t right. Don’t look for minutes. Start looking for seconds. Instead of looking at my overall process and trying to wring more productivity out of it, I should have taken a deep dive into the foundation of each department’s tasks. Finding small ways to improve that don't take much effort or investment is higher value than rejiggering and rearranging every aspect of your overall workflow. Here's the most lucrative question a great shop owner is always asking: where could I save the most time for the least money? You'll get close to your screens. So get close to your processes. Boost productivity, throughput, and streamline tasks by working from the bottom-up. It seems simple: look at the actual tasks your employees do every day and cut down on waste. Poor (or nonexistent) ink and platen temperature setup. Poor prep and setup support for press operators. Lack of instructions and processes. Let’s dive in and dissect each one of these problems! Reclaiming screens: the heart of the matter. The first word in “screen printing” says it all: your screens are directly related to how successful your shop is. If screen reclaimation is left to chance, your shop is throwing away money. This does not start at coating your screens with emulsion or dialing in exposure times. It starts before that: proper reclamation and degreasing. The first steps are basic – thoroughly clean and degrease the screen. Then flood rinse your screens with a slow, steady stream of water – don’t just blast them with a pressure washer. This ensures any chemicals are completely rinsed from the screen. The next step is drying your screens. This seems simple – just let them dry, right? Wrong. A simple PVC pipe with a slit attached to a vacuum is a great screen cleaning unit. It helps screens dry faster. This reduces the time it takes to actually re-use a screen. Time spent waiting for water to dry off your screens is the definition of waste! It stops problems with dust and pinholes. Water is like a magnet to dust. The sediment and dust in your shop can contaminate your screen mesh, and water makes it much worse. We’ve all had to spend time cleaning up pinholes – this can dramatically reduce that waste. Storing your vacuum is easy. Don’t overlook your screens. They are the core of every screen printing shop. A vacuum wand to expedite drying is an easy win that you can implement today. Staying warm during a "cold snap" in Florida. We’ve all encountered it before: you have to waste the first 45 minutes of your day reducing the viscosity of your ink. White ink on a cold Monday morning might as well be partially dried cement. For automatic printers, it’s another wasteful nuisance. For manual printers, this is torture. You print slower than you’d like, beat up your body to start the day, and reduce your productivity for the entire day. So whose fault is this? The production manager. Ultimately, it’s the manager’s job to facilitate the smoothest possible process for press operators. Whether you’re printing with a giant automatic screen printing press or running a small job on a manual press, you need to get your white inks ready for the press. Luckily, there’s a very easy solution: use a mixing drill to blend your white ink. The friction and heat from the drill ensure that white ink prints the same on the first print as it does on the 500th. Mixed ink = happy ink. You also need to warm your platens. This is easier with an automatic press (you can simply send your platens around to your flash unit, or utilize the press’ setting to warm platens). Yes – the production manager is responsible for these elements of setup. Why? Because that’s the production manager’s job. Printers and press operators are there to print. Managers are there to make sure printers can do their job. Mixing ink and warming platens is not printing, and it’s not the most productive use of a printer’s time! Quick "press operator kits" are a great way to boost productivity. This is so easy to overlook. But it’s the easiest and fastest way to increase profitability. Here’s a powerful exercise for your shop: schedule the first 2 hours of a shift to shadow your best (and hopefully highest paid) press operator. Carefully watch what they’re doing, but don’t interfere. What are they doing during that crucial first 25% of their shift? If they’re doing anything besides setting up a job, breaking down a job, or printing, then it’s time to update your procedures. Why? Because a printer that’s doing something other than their most productive tasks is wasting wages and diminishing the potential earnings of the press they’re operating. This isn’t the printer’s fault. The press operator is doing what they (correctly) believe they should: doing what it takes to get the job done. But here’s the problem. Every minute they spend with an idle press is money out of your shop’s pocket. I’ve run basic calculations and found that the low end of losses from idle presses is around $5 per minute. If your best printer is wasting 1 hour a week performing tasks that aren’t printing, you’re throwing away $300. An hour a week is not a lot of time. That’s only 12 minutes per shift. You could hire someone at $15 an hour to work nearly 20 hours a week in your shop performing setup and prep for the same “price” you pay to have your best press operator fumble around just to start printing. It is impossible to have no downtime and 100% productivity. But you can and should control what can be controlled. Treat your press operators’ time like the precious and valuable resource it is. Support them, prime them to do their most valuable task, and ask them how you can help keep them printing instead of doing a less valuable activity. Like goes with like – or everyone slows down. Imagine that a print shop has two jobs happening simultaneously. The shop has two automatic presses, one conveyor dryer, and a few manual presses. The first job is a sensitive polyester job for an upcoming athletic event. The second job is a water based print. The shop doesn’t have a split-belt dryer. One automatic press is printing the athletic wear. The other automatic press is off. In the corner, a press operator is manually printing the water based job. You ask the press operator why he’s printing the job manually and he tells you, correctly, that “I can’t print these shirts while he prints those.” Guess what? The press operator is 100% correct. Because of poor job scheduling, the shop is paying someone to be less productive. Your printers are stuck doing the best they can, but any profit the jobs had is rapidly diminished. So how do you prevent this? How do you schedule jobs in a better way? Have approximately 3 days of production “wiggle room” available. This grants you room to move jobs around and not miss due dates. Schedule jobs that are alike together. If jobs have similar requirements, use similar substrates, have the same printing process, or otherwise are similar – group them together for maximum productivity. Know when to schedule jobs in your workflow. Example: always print hoodies at the end of a shift. Printers don’t have to retape their platens to start a t-shirt job. Plan platen changes toward the end of the day. If jobs have similar platen requirements, group them together. Don’t print on a sleeve, then run a job with a front chest print, then later print another job with sleeves. Put all of the jobs that require sleeve printing near each other, then plan for a platen change, then print the front chest print. You won’t always know if your scheduling is as effective as it should be. So what should you do? Solicit feedback from your printers early and often – and offer them a way to feed your production manager constructive criticism. While that may seem like dreaded downtime, it’s actually an investment in improving your process. Iteration, feedback, and improvement are very valuable activities. They make you more profitable in the future. I can’t press on this topic enough: every possible process and activity in your shop needs a clear roadmap. If you’re leaving things open for interpretation, you are setting your staff up for failure and ensuring you will be disappointed when an employee doesn’t exercise perfect judgment. If you’ve said things like “Who told you to do that?” and “Why did you think that’s how to do it?” – then you didn’t make it as foolproof as you should. People are not dumb – they’re human. Some people with incredible common sense will shock you when they do something very wrong. When you rely on common sense, you’ll find that things you consider “common sense” about your shop are not common, clear, or coherent at all – and may outright confuse even the smartest printers. Rock-solid processes. Capture every process that happens in your shop and document every part of it. Clear visual aides. 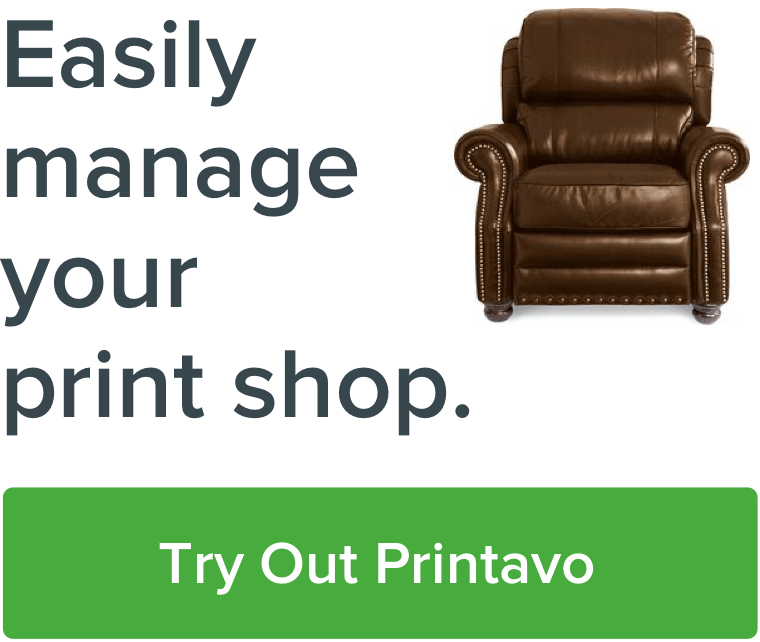 Create clear and usable guides for your printers and employees to follow. Checklists and documentation. Utilize checklists and documentation to root out errors. Define common problems and how to resolve them. Create a "if this, then that" workflow for common problems. Easy to understand job descriptions. Define the exact tasks that are most valuable for that position. Clear roles for every employee. Define boundaries, expectations, and their exact role in the shop's operations. If you want to take control of your print shop’s finances and ensure profitability, dig deep into the fundamental processes and habits at your print shop. Printers should print, managers should manage, and everyone should collaborate to remove blockers and boost productivity. The small errors in process management add up to expensive mistakes over time. This takes time, energy, and effort to do. But you have to start. Begin the route to reliable profitability today: stop making the same small mistakes that put print shops all over the country out of business every year.